Camp NaNoWriMo this time has been fun as always, and I'm looking forward to participating again in the future. A big achievement in my blogging life. 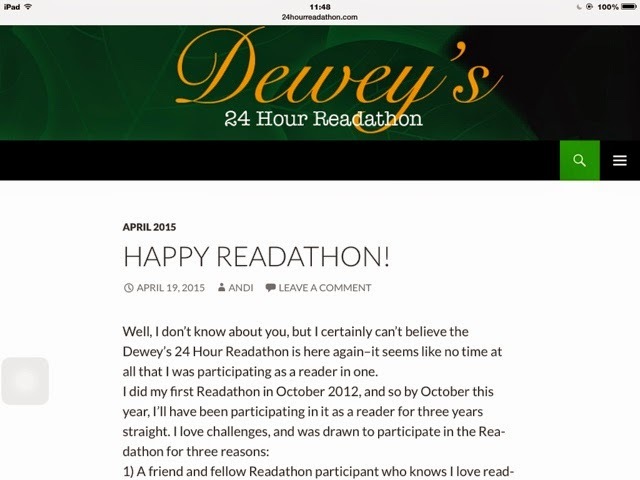 A couple of months ago, I started drafting my pre readathon post for this month's event, which begins next Saturday (25 April). Andi, the organiser, promised me last year that I would be able to do a warm up post for them this year because I missed my slot last year. It's just been published on the website today. Here's the direct link for the post (click on the title of the post on the main page to get to it). There's a comment form at the bottom, so feel free to leave a comment! I am feeling proud of this, because, ever since I started blogging, it's the only blog entry I've had published anywhere outside of my own blogs. I've been thinking recently that I want to get my blog some more traffic somehow, and I would also love to be able to review authors' books and get a copy in exchange for an honest review. That said, I'm not really sure how I should even begin to go about that. It sounds like I have to start doing some research. If you read this, and have any ideas on how I could make this happen for myself, please leave a comment. I'd really appreciate some helpful input . Labels: A big achievement in my blogging life. I have always struggled with weight gain and then weight loss, and maintaining my weight is difficult, because of my disability, so I have always put weight on around my stomach and thigh area . This has always made me feel really self conscious as well because I love buying nice clothes, and hate the thought that, when I'm out, people might be staring at my stomach area. (I don't know whether they are or not, they could be staring at me because I'm in a wheelchair or they could be staring at some other part of my body, but thankfully that is the upside of having not very good eyesight). I do tend to assume that people are staring at my body though – I think it's probably some built in mechanism from years ago, because I've always had hangups about people staring at me. I will never forget the day when, years ago whilst moving into a new apartment, the first thing that the landlady asked was whether I was pregnant because she told that I had put on weight since the last time she saw me. I will never live that down – the fact is that I wasn't pregnant , and had just put on some weight. I really don't like the way that society often, and wrongly, assumes that just because your stomach area is slightly larger than the rest of you that it automatically means you are pregnant. That aside, I would love to be a mother one day and Alfredo and I are planning to have a family, and see ourselves as capable despite the extra challenges my disability brings. Unfortunately, in my experience it is not only strangers that have pointed things out about my body I don't like , but it also has involved close members of my family. I can remember that when I was going through puberty, my mum kept calling me "thunder thighs ", because that was the first area of me to develop. In reality, my thighs weren't that big, but the words really hurt me, she probably didn't mean, it nastily , but I have never been able to take jokes well– and even struggle to now. I'm still quite sensitive to people's perceptions of my body. I spent most of my adolescent years being a UK size 10 to 12, and then dropped to about size 6 to 8 during my university years, and put weight on since then and am now a size 16 and sometimes 14, although I would love to get down to around a size 12 and then keep going until I get back to a size 10, although in reality I was happier about my body when I was a size 6 to 8. A lot of why my stomach looks so big is my posture, because of not being able to sit straight in my wheelchair or stand straight (when someone holds me up), so this, coupled with my short height of 5 foot 2" , makes me look bigger than I actually am, although I do know that once I lose some of the weight off my stomach, I will look slimmer and that's what I want. I have lost weight since last August though, when I was 13 stone (182 pounds) , my heaviest ever, and I'm now around 11 (154 pounds). It's not a lot, I know, but it's something, and that's important to me. How my stomach looks is part of the fact that I don't take very many pictures of myself to put on social networks. My action plan is to go swimming more now that the outdoor pool will be opening again in May. Unfortunately, near where I live, there is no indoor swimming pool so I can't go to the pool in other months of the year as much as I would like to, and the swimming pools in other nearby areas are not wheelchair accessible. Although I can't move around as much as someone who doesn't have my disability, I am still fashion conscious and conscious of the need to be nearer to my ideal weight for both fashion and health reasons. My diet is not a problem because I already eat really healthily, I just need to do some more exercise which is what I can do if someone actually does the exercises on me, or holds me in the pool and moves me about while I'm in there. Sometimes, I have realised that even now I can wear medium size clothes instead of large, but it does depend on the shop and also the closing style . This summer, I'm determined to lose some weight from my stomach, and to be more toned there. Years ago, I borrowed one of those belts that tone your stomach area, but I'm not sure about the long-term use of something like that in my case because of the fact that I have muscle spasms because of my cerebral palsy and also because I have a valve and draining tube inside my brain because of my hydrocephalus. The draining tube goes all the way down to my abdomen, so I'm not sure what kind of an impact using something like a toning belt for weight loss could have. 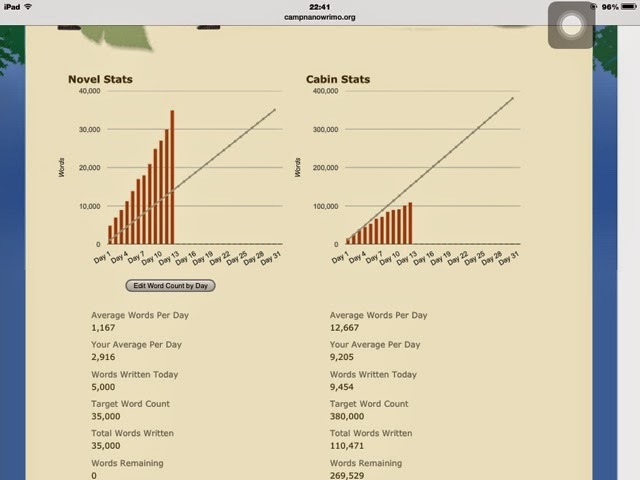 12 days since Camp NaNoWriMo began, I have crossed the finish line! 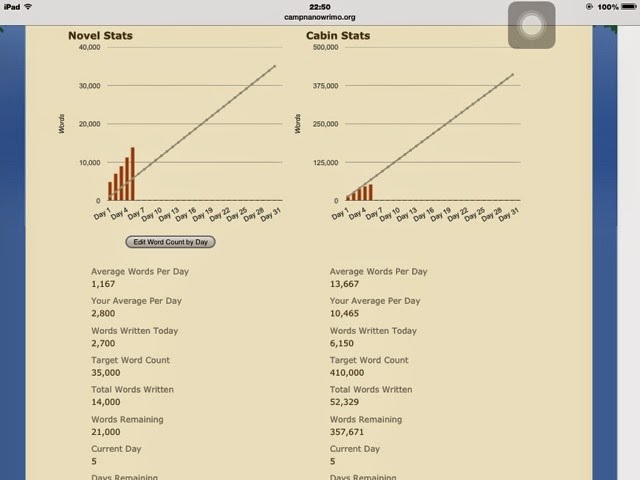 This month also marks a year of my participation in Camp NaNoWriMo (my first attempt at Camp NaNoWriMo was in April 2014 and my second was in July 2014). I'll spend the next few weeks editing and adding to my draft. With it being Easter weekend, I still managed to get a lot done for my novel. I also "fleshed out" some characters to make them more rounded and real, and added to my plan, as well as having an enjoyable Easter sending and receiving ecards. in between times, I'm doing a lot of reading. At the moment, I'm reading a lot of real life memoir stories by Cathy Glass. I'm hoping to get a lot more done this week, but like my progress so far. Between today and yesterday, I've done another 4,000 words, taking my total up to 9,000 words. i'm very pleased with my progress this time, and with my choice of story and genre. I'm hoping to Get well up past 10,000 words this weekend. I hope You have a great Easter weekend! 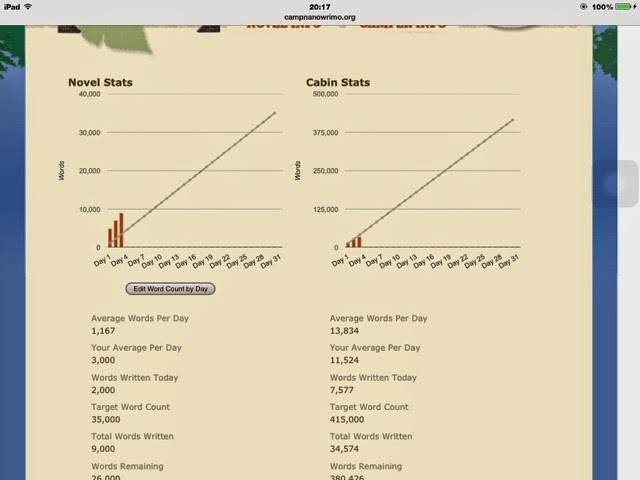 I'll keep updating you on my progress theoughout Camp NaNoWriMo. Yesterday, there was a virtual write in and it was published on YouTube. There'll be more, and I'll post them here as well as on my From First Draft to publication blog (my writing blog) which is also here on blogger.